Rumour: More seiyuu to appear at Busho Matsuri? A retracted update to an article on Capcom's Sengoku Basara news feed yesterday showed that seiyuu Seki Tomokazu (Ishida Mitsunari) and Okiayu Ryoutarou (Toyotomi Hideyoshi) had been added as new guests for July's Busho Matsuri live event. A fan snapped a picture of the update before it was taken down so this rumour looks reliable - even though Capcom silently removed the information shortly after it was discovered. Squinting at the picture, it looks as though both seiyuu were provisionally scheduled to appear on the first day, but in the evening performance rather than the noon one (which features the Sengoku Basara 4 updates and Ikeda Shuuichi). Perhaps there'll be a second presentation from KobaP in the evening, and perhaps he'll be revealing that Mitsunari and Hideyoshi will be part of the new game..? Either way, the fact that Capcom prepared the announcement means they aren't surprise guests, so their presence may not mean much. It's weird to see more seiyuu guests added since the Busho Matsuri event has always been pitched at fans of the Butai Sengoku Basara stage plays. Edit 30/05/2013: This has now been confirmed! Both seiyuu will appear in the evening show's Sengoku Basara 4 presentation. 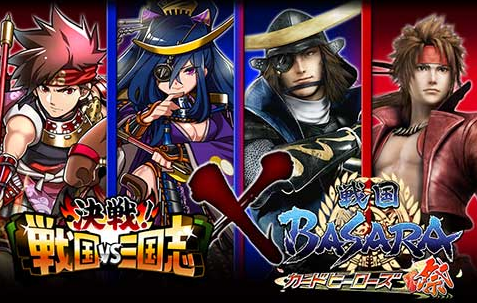 The other news from the past few days is that Sengoku Basara Card Heroes Matsuri will be featuring in a crossover with Kessen! 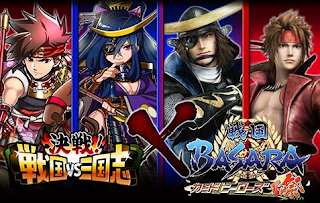 Sengoku VS Sangokushi, another mobile game based on Japanese (and Chinese) history. 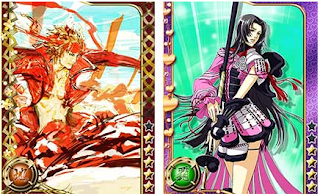 To celebrate the first anniversary of Sengoku Basara Card Heroes Matsuri, which is today, a collaboration event is running until the 25th June 2013. Playing Kessen! Sengoku VS Sangokushi during the event period will reward you with Yukimura and Oichi bonuses in the game. 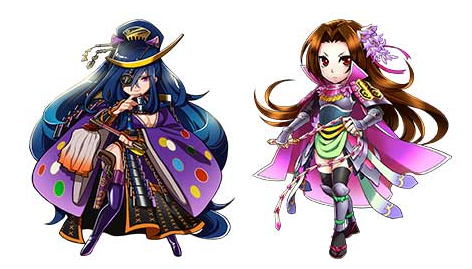 Meanwhile, fans who play Sengoku Basara Card Heroes Matsuri while the event is running can earn cards featuring depictions of Date Masamune and Oichi from the other game.